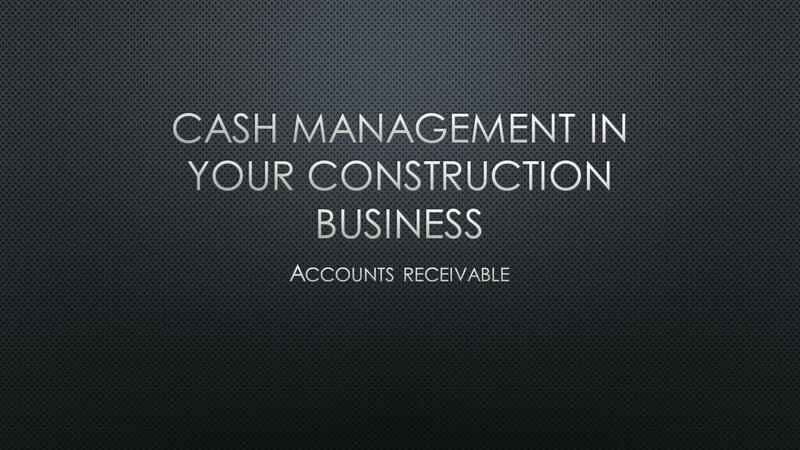 Accounts receivable is a major part of business. And it’s not a topic that should just be limited to your accounting department; you need to have an understanding of what it is and how it affects the cash management cycle. So, what exactly is accounts receivable? Simply put, it refers to invoices you’ve billed and sent to customer, but that have not been paid yet. This actually becomes an asset for the business as you wait for the cash to come in. Now, let’s take it a step further and talk about aging of accounts receivable. Accounts receivable aging is a periodic report that categorizes the amount of money owed to the company according to the length of time the invoice has been outstanding (in other words, just sitting with our customers). Typically this timeframe is 30, 60, 90, or in some cases as long as 120 days. In construction, have a retention column but we’ll save that subject for another blog. In your accounts receivable aging report, you want to make sure you’re managing all columns and paying special attention to that 60-day column. Why? Because once an invoice gets to 90 days unpaid, many banks and other outside agencies don’t count it as an asset anymore. They basically don’t think it’ll be collected by that time — and as a result they’ll either give you discounted credit or worse, no credit. Just remember, once the invoice date hits your system, it’s going to start aging! Negotiate terms in writing. We always refer to contract agreements in the construction industry, but this could also be in the form of a PO or work order. There must be some type of documentation between the customer and contractor that outlines what both parties are expecting. It helps to include such things as payment terms, any discounts applied, and what happens if you’re not paid. Bill in a timely manner. As hard as it is to believe, your customer actually does want your bill. The sooner they can get it into their accounts payable system, the better and easier the process becomes on their end. It’s a major piece of the cash management cycle to ensure invoices go out in a timely and accurate manner. If you don’t bill it, you can’t get paid! Complete the work. It may seem out of place in this particular top five, but we’re including it for this simple reason: Because the customer will pay you upon completion of work! If they’re taking longer to pay or haven’t paid the retention, they could be under the impression that something else still needs to be done. So contact the customer with a simple phone call to talk things through, complete your punch list, and do what it takes to finish the job and collect the money. Provide detailed descriptions. Have you ever gotten an invoice that says “Services rendered” and didn’t remember what it meant? That’s why “services rendered” doesn’t cut it. Specify all the job details on the invoice — it makes it easier for the customer to cut the check when they can remember the work that was done. It also helps the accounting departments for both parties too. Follow your credit policy. These policies are there for a reason. We recommend that everyone has a credit policy, whether it specifies that you call the customer after 14 days, that you send a red letter, etc. And if you use a collection agency, know when you’re going to call them. It can create problems if you don’t follow the credit policy and hit all the specified dates (especially if you’re dealing with a lien).